During the 36th regular session of the UN Human Rights Council, which took place from 11 to 29 September 2017, FORUM-ASIA’s advocacy focused on Burma/Myanmar and Cambodia, as well as on drawing attention to Bangladesh, the Maldives, and the Philippines. FORUM-ASIA also spoke during the UPR adoptions of India and Indonesia, and included Pakistan and Sri Lanka in its oral statement during the item 2 general debate. It also drew attention to ASEAN’s failure to address deteriorating human rights situations in the region on the occasion of the regional organisation’s 50th anniversary this year. FORUM-ASIA participated in cross-regional side events on human rights defenders and on foreign policy of states toward human rights. Throughout the three weeks of the session, FORUM-ASIA delivered nine oral statements, organised five side events, supported six joint letters, released three press statements, and supported a joint civil society statement at the end of the Council session. 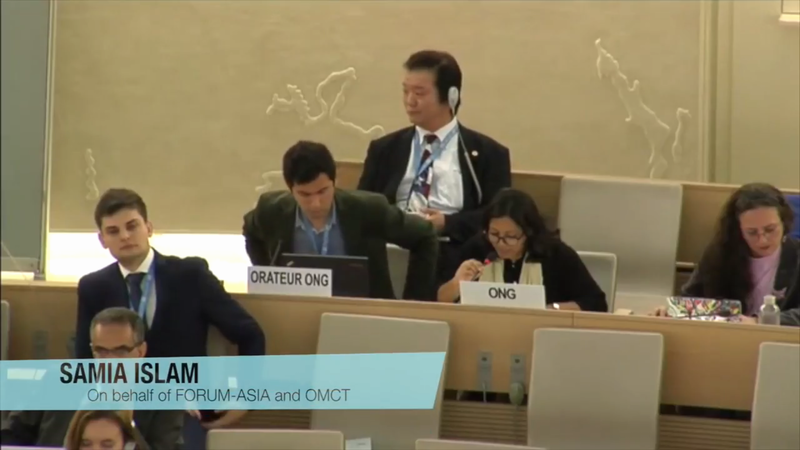 FORUM-ASIA delivered a statement on enforced disappearances in Bangladesh during the item 3 general debate. The statement expressed concerns that the numbers of those disappeared may increase as Bangladesh heads towards elections next year, and calls on the Council “to pay close attention to enforced disappearances in Bangladesh and urge the government to take action and put an end to enforced disappearances.” It further calls on the government of Bangladesh to “fully cooperate with UN human rights mechanisms and accept the pending visit request from the Working Group on Enforced or Involuntary Disappearances (WGEID) and provide it with unhindered access.” FORUM-ASIA also spoke of threats to freedoms of association and expression in Bangladesh during the item 4 general debate, including restrictions imposed by the Digital Security Act, and the Information and Communication Act. 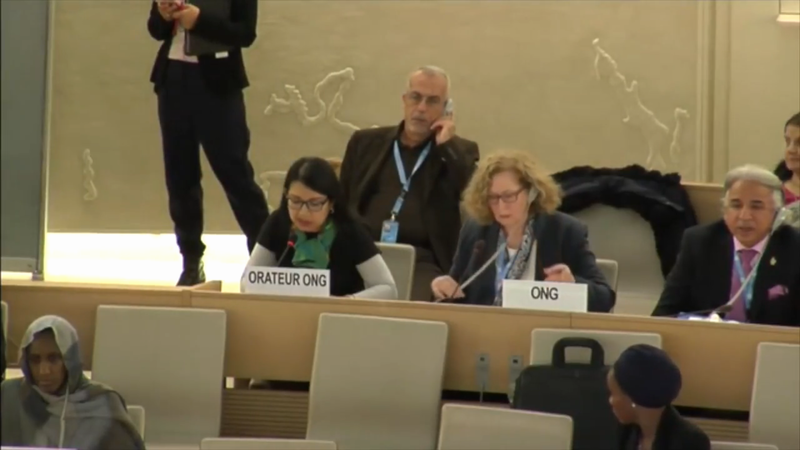 The Fact-Finding Mission on Myanmar delivered its first update to the Human Rights Council this session. During the update, the Fact-Finding Mission requested the Council to extend its mandate due to the delay in its formation and the escalation of the situation in northern Rakhine. 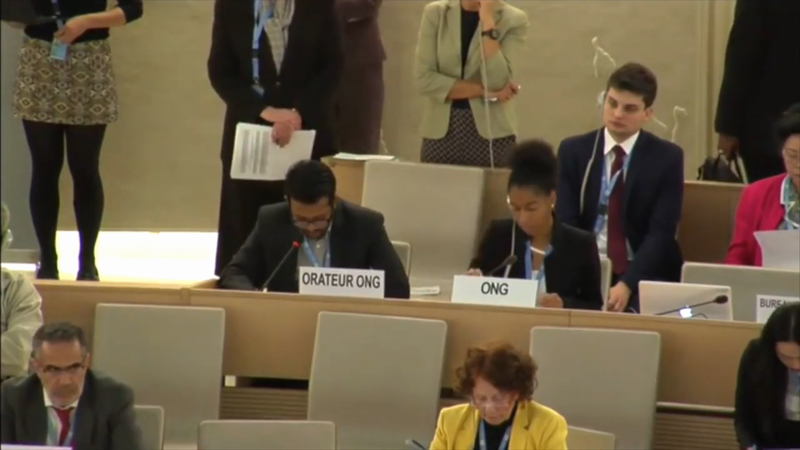 As a result, the Human Rights Council passed a decision, which extends the mandate of the Fact-Finding Mission until September 2018. During the interactive dialogue with the Fact-Finding Mission, FORUM-ASIA called for an immediate end to attacks on civilians; and full and unhindered access for humanitarian aid, independent observers and the Fact-Finding Mission on Myanmar. It also drew attention to the situation in Myanmar during the item 2, and item 8 general debates, as well as in a joint open letter to states. FORUM-ASIA’s press release on the Myanmar decision was covered by AFP. The biannual resolution on Cambodia, which was adopted at this Council session, authorised the OHCHR to submit an additional report on Cambodia during the 37th session of the Council in March. In its prior to this advocacy, FORUM-ASIA had called for increased attention on Cambodia ahead of its July 2017 elections. FORUM-ASIA drew attention to shrinking democratic space in Cambodia during the interactive dialogue with the Special Rapporteur on Cambodia, as well as the item 2 general debate. In collaboration with other international civil society organisations, FORUM-ASIA organised a side event on Cambodia and sent a joint open letter to states. FORUM-ASIA released a press release on the Cambodia resolution. In his update to the Council, the UN High Commissioner for Human Rights called on the government of the Maldives to “establish an enabling environment for the exercise of fundamental freedoms, including freedom of expression and assembly, and to respect the people’s right to an independent and impartial judiciary.” He also requested the government to maintain the moratorium on the death penalty. Following his update, several states included the Maldives in their national statements. FORUM-ASIA spoke on the Maldives during the same debate, echoing concerns regarding attacks on democratic space ahead of elections in 2018; calling on the government to immediately restore freedoms of expression, assembly and association; and calling on the UN to closely monitor the country prior to elections. It also spoke on threats on the independence of the judiciary during the item 4 general debate. 39 states supported a joint statement expressing serious concern in light of the thousands of killings and impunity associated with the ‘war on drugs’ in the Philippines. The Universal Periodic Review (UPR) of the Philippines, in which the Government did not fully accept 154 of the 257 recommendations it received from states, was also adopted during this Council session. 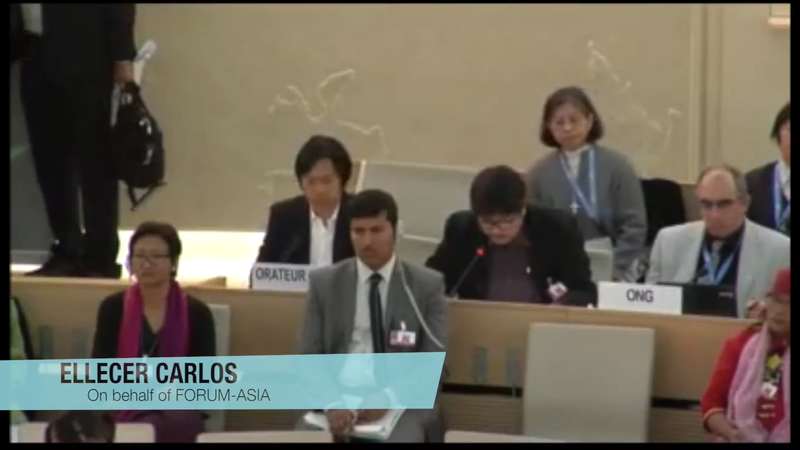 During the UPR adoption of the Philippines, FORUM-ASIA expressed regret that the Philippines did not fully accept recommendations on ending and investigating extrajudicial killings, protecting human rights defenders, and ensuring the right to freedom of expression. FORUM-ASIA also spoke on the Philippines during the item 2, item 4, and item 8 general debates, and had earlier called for concerted action on the Philippines in a joint open letter to states. FORUM-ASIA organised a side event on the Philippines and facilitated the participation of a human rights defender from the Philippines in a cross-regional side event on ending reprisals. Following the joint statement of 39 states on the Philippines, FORUM-ASIA issued a press release to which the government responded and which was widely covered in local media, including ABS-CBN, GMA 7, Manila Bulletin, and Philippine Star. FORUM-ASIA organised a side event on the foreign policy of Southern States towards human rights in which it showcased its research on Asian foreign policy at the Human Rights Council. Speakers from Brazil, India, South Africa, and the Commonwealth Human Rights Initiative provided insight on the foreign policy of Southern States from various regions. The importance of documenting international human rights standards and practice was discussed by NGOs, the academic community, and OHCHR in a side event organised by FORUM-ASIA. FORUM-ASIA also co-sponsored a side event on supporting indigenous and environmental civil society, and provided the perspective of Asian human rights defenders alongside their counterparts from Africa and Latin America.